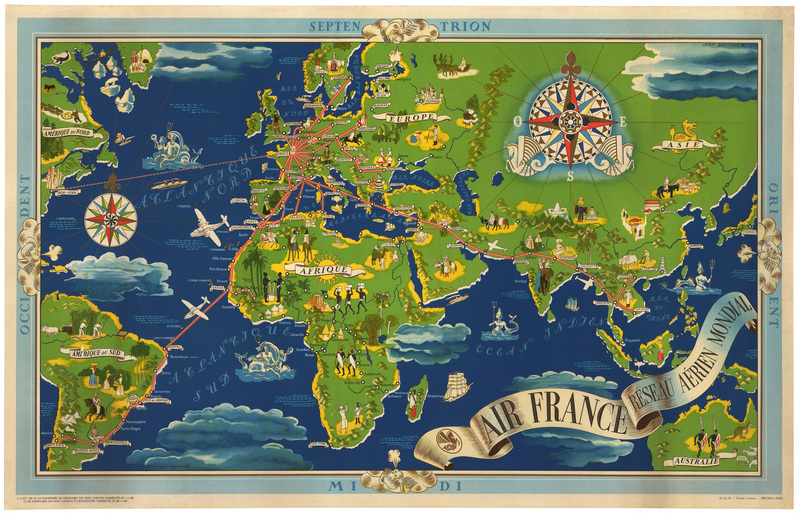 1937 Air France Reseau Aerien Mondial - the Vintage Map Shop, Inc. This is an early Air France poster showing the airline's nascent network, published only four years after the airline was founded. Among the airlines of the world, Air France has always gone to great lengths in promoting the services it provides to the world, and issued a series of posters of stunning design. All are highly collectible, especially the Planisphere series to which this poster belongs, designed by Lucian Boucher. Boucher's posters are renowned among collectors and highly sought after. This poster illustrates the airline’s services to various international destinations, including their routes from Paris to New York, Rio de Janeiro, Buenos Aires and Santiago in the Americas; Dakar, Algiers, Casablanca and Tunis in Africa; and to Damascus, Baghdad, Calcutta and Bangkok in Asia, ending at the French colonies of Hanoi and Saigon in Vietnam. The map is decorated with some of the traditional elements of world maps, including large compass roses, galleons, Neptune with tritons, with vignette illustrations across the land. Each destination is designated by easily recognizable illustrations of widely-known landmarks of that country, or other stereotypical images by which the destination country would be identified. Lucien Boucher (1889-1971) started his career as a cartoonist for satirical magazines before focusing on poster artwork for film and advertising. He is best known for the series of Air France posters that he made between 1934 and 1962.